Fudgy is the only word that describes the bars. They’re the banana equivalent of moist, fudgy brownies with zero traces of cakiness. The bars are rich, soft, supremely moist, and tooth-sinkingly dense and satisfying. 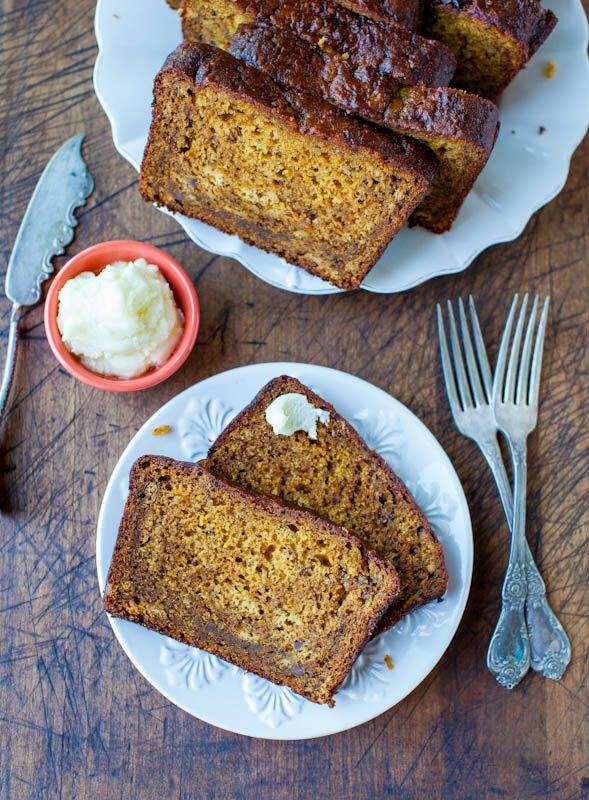 If you’re looking for a fluffy slice of banana cake or banana bread, they’re not that. They’re adapted from my Lemon Lemonies, the lemon equivalent of fudgy brownies. 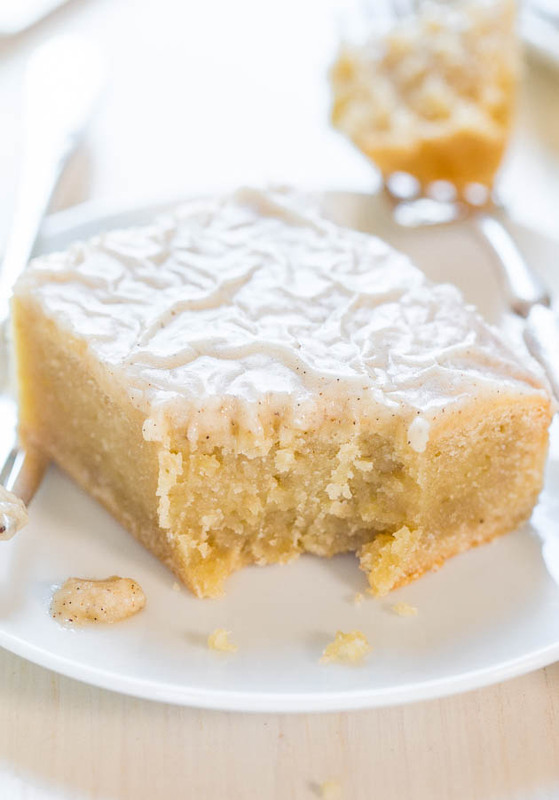 The dense texture of the Lemonies was so perfect and unlike anything else I had ever made. I kept thinking about them and it dawned on me that maybe I could do the same thing with bananas. It’s an easy, no-mixer recipe and the glaze makes the bars go from really darn good to out-of-this world amazing. It’s a must-make. The secrets are browned butter and glorious specks of vanilla beans. I cannot think of two more powerfully flavorful ingredients than browned butter or vanilla beans seeds, and flavor just explodes from the glaze. If you’ve never browned butter, read this tutorial. The 5 minutes it takes to do is the best 5 minutes you’ll spend all month. I used vanilla bean paste but scraping the seeds of a vanilla bean works. Vanilla extract is okay, but won’t be as flavorfully intense as paste or seeds. After pouring the glaze over the warm bars, it seeps down and soaks in, and makes the bars even moister and softer. The rippled appearance that’s created as it sets up enhances the homey comfort food factor. I normally have a piece or two of what I make and give the rest to my family or re-home the leftovers with friends and neighbors, but I hoarded these. Definitely one of my best recipes of 2014 and I’ll happily do all the cardio in the world to keep on hoarding. Fudgy is the only word that describes the bars. They’re the banana equivalent of moist, fudgy brownies with zero traces of cakiness. The bars are rich, soft, supremely moist, and tooth-sinkingly dense and satisfying. 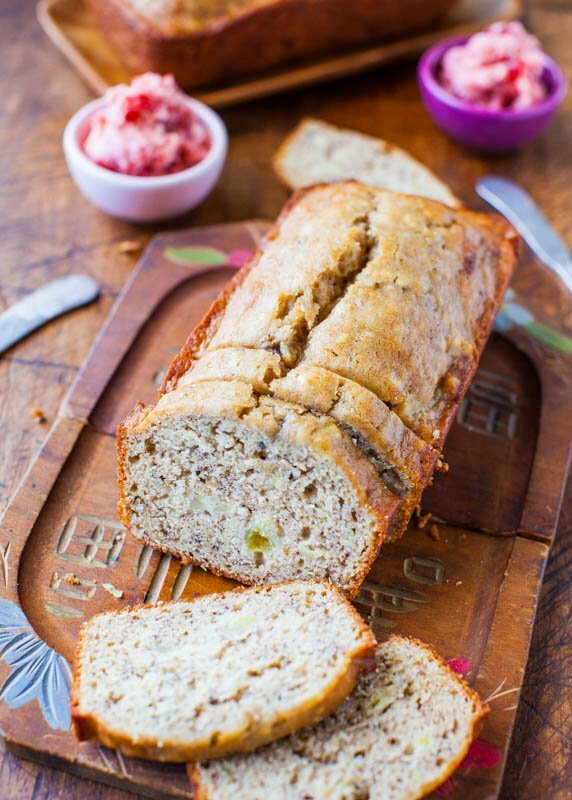 If you’re looking for a fluffy slice of banana cake or banana bread, they’re not that. 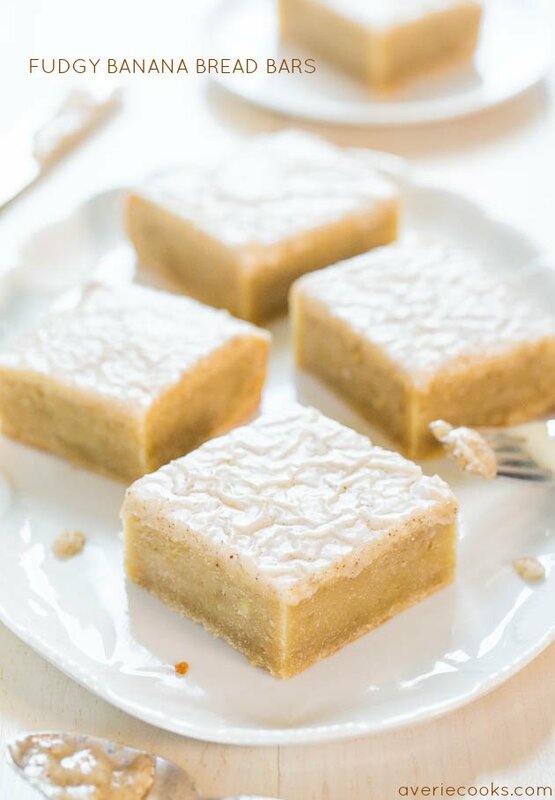 It’s an easy, no-mixer recipe and the glaze makes the bars go from really darn good to out-of-this world amazing. It’s a must-make. The secrets are browned butter and glorious specks of vanilla beans. I used vanilla bean paste but scraping the seeds of a vanilla bean works. Vanilla extract is okay but won’t be as flavorfully intense. The glaze seeps into the bars, and makes them even moister and softer. Bars – In a large, microwave-safe bowl add the white chocolate, butter, and heat to melt, about 2 minutes on high power. Stop to check and stir after 1 minute, and then heat in 20-second bursts, stopping to stir after each burst, until mixture can be stirred smooth. White chocolate is very prone to scorching and seizing up, so watch it carefully and don’t overheat. Wait momentarily before adding the egg so you don’t scramble it. Add the egg, sugar, vanilla, and whisk until combined. Stir in the bananas until well-combined. Bake for about 32 to 33 minutes, or until a toothpick inserted in the center comes out mostly clean, or with a few moist crumbs, but no batter. In the last 15 minutes of baking, make the glaze. Glaze – Brown the butter (click for tutorial). Cook butter over medium-high heat in a small saucepan until it’s amber to brown in color, about 5 minutes depending on pan size, but watch it closely so you don’t burn it. I swirl the pan in the last minute or so to make sure I can really see the color changes. Butter will go through stages of hissing, sputtering, and making noise until the water cooks off at which point the browning occurs. Butter will smell nutty and aromatic. Transfer butter, including brown bits at the bottom of the pan (they’re flavor powerhouses, keep them) from pan to large mixing bowl which stops any carryover cooking. Add the confectioners’ sugar, vanilla bean paste, optional salt, and slowly add the milk, whisking until smooth or beat with a handheld electric mixer. As necessary, add additional cream (or confectioners’ sugar) to reach desired glaze consistency. Glaze should be of medium thickness and easily pourable. Evenly pour glaze over bars (they don’t have to be cooled first), smoothing it lightly with a spatula if necessary, but glaze will likely just slide into place. Allow bars to cool in pan uncovered for at least 2 to 3 hours, (or overnight and cover with a sheet of foil) before slicing and serving so glaze can set up. Bars will keep airtight at room temperature for up to 1 week, or in the freezer for up to 6 months. I made these tonight and, as anticipated, they were awesome! Even my husband loved them, who usually isn’t a fan of banana-y things. One little thing I did do differently was brown the butter that I added to the batter, in addition to that for the glaze. I poured it hot over the white chocolate chips and it was the perfect amount of heat to melt the chips, no help from the microwave needed, and then was quickly cooled enough to add the eggs – in case anyone else wants to give that a try! Thanks for the recipe, Averie! 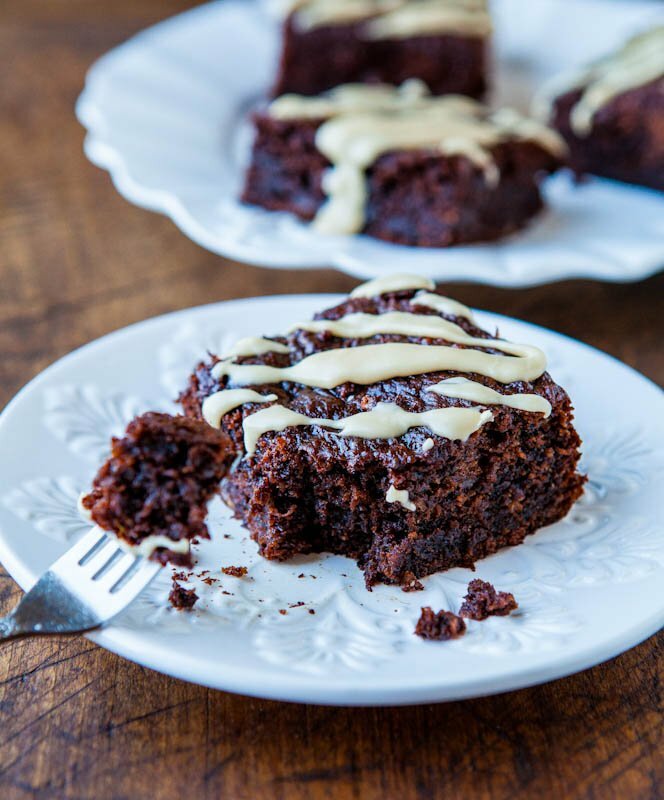 I love your idea of using browned butter IN the batter itself and that it melted the white chocolate easily and in no time and what amazing flavor it must have added! I totally need to try that! Thanks for the idea and glad your husband even liked these! I made these yesterday, and they were amazing! I expected something quite rich and heavy, but to my surprise they weren’t. I don’t like melting chocolate in the microwave, so I used a saucepan, and then mixed everything else in in that pan. I added the sugar and vanilla first, and then the egg, no problems that way. I just need to say one thing, I poured the glaze over the “cake” part right out of the oven, and next time I will let it cool down a bit first. The glaze slightly separated immediately, leaving areas that taste like taking a bite out of a stick of butter. Thanks for trying the recipe and I’m glad it came out great for you! I have never had any issues with the glaze separating but sounds like you know for your situation you should wait a bit longer next time. Glad they’re perfect for you overall! I think that you possible over-floured the dough, or your bananas just weren’t as juicy as mine, or something made your batter much more dry than mine. Therefore, if you remake, I’d add another banana, or as you said maybe a splash of milk, or reduce the flour amount so that it’s thick enough but not so thick it’s just over-the-top thick. Use your judgment on that. There are any number of tweaks that could probably help things although I haven’t tried them and only have made (and remade) this recipe as written exactly but dry batter is an easy fix, overall! Good luck! Second time making these. Made exactly as written and have no problems. While they are good the first day, they are so worth the wait the next day. It seems a lot of baked banana goods are so much better after resting overnight. This recipe is definitely a keeper, thanks! Thanks for trying the recipe and I’m glad it came out great for you! I totally agree Day 2 is where it’s at if you can wait! 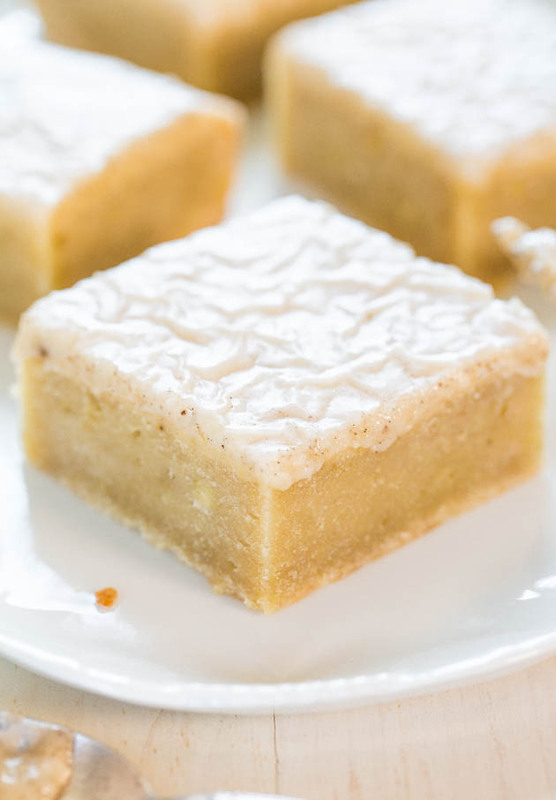 These fudgy banana bars are FABULOUS. My only question is how anyone could possibly know they will last a week at room temperature. There’s no way these gems last more than a few hours in my house!! Any idea if this will work with vanilla chips instead of white chocolate? I haven’t tried with vanilla chips but I’d be inclined to say, yes probably okay, but haven’t personally tried. Amazing!!! 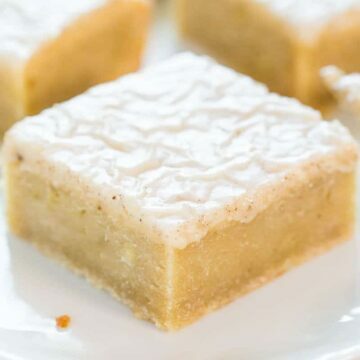 These got rave reviews from my family-my brother said these were “the best thing you’ve ever made” I halved the sugar because my bananas were really ripe, and they turned out great. Thanks for trying the recipe and I’m glad it came out great for you! Good call on halving the sugar due to the very ripe bananas! I made these tonight, and put a crumb base on mine and they are amazing. Instead of the foil, I used 5 tbsp butter softened, 1/3 cup brown sugar (packed), 1 cup four, whisked it with a fork and sprayed they pan with cooking spray and packed in 3/4 of the mix and baked it for 15 minutes. Then added the batter, and sprinkled the rest on top and baked it. Delish (I also put the glaze on. Wonderful! Thanks for trying the recipe and I’m glad it came out great for you with the tweaks you made! The crumb base sounds excellent and the rest as a topping, bet it was wonderful! Will the recipe work if I just leave out the white chocolate? White chocolate isn’t for me. Can I sub butterscotch chips? These were very good! My glaze never set up so it has more of a browned butter sauce. Any ideas? Still fantastic and I’d definitely make it again. Add more sugar next time and/or less milk to thicken it up and it will firm up and not be as loose. Glad you enjoyed them overall and will make again! 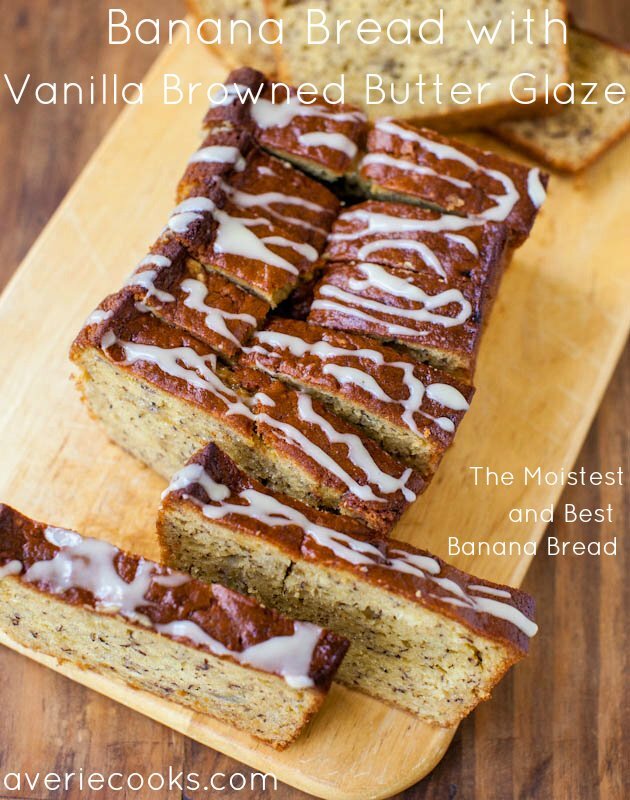 My new favorite way to use up overripe bananas! In fact, I’ll probably start buying more bananas than we can eat, just so some are available. Thanks for sharing this! I’m so glad this is a favorite of yours! I haven’t made this in awhile but I love banana anything and this one is one of my personal faves! The density of it, and the glaze, I need to make it soon myself! These bars…there are not enough superlatives for these bars! I will never waste bananas on banana bread again, that’s for sure. This was also my first experience with brown butter glaze, and I’m telling you that the glaze alone is worth the price of admission! These bars are so good, they should be a part of the food pyramid! EXCELLENT recipe and the directions were perfect! Thank you! I agree that they should be part of the food pyramid! I love them so much too! Glad you’re a huge fan as well! The taste is fabulous, and we loved the glaze, but the actual bars were a bit heavy. Do you think I could add a little bit less flour and it would still be ok? I stir much after flour, just enough to combine. Glad you enjoyed the taste! These are a very dense and heavy bar. That’s just the nature of them – a fudgy, thick texture that’s almost fudge-like. I can’t speak about experimenting with the flour and the results. 2. Made a quick salted caramel sauce in the microwave and drizzled over while still warm. It was a huge hit with the fam and I’ll definitely be making it again soon! Yum! You cannot go wrong with chocolate or salted caramel! I bet they were delicious additions and glad you will make it again soon! Can I use coconut milk in place of the cream? I think that would be fine but haven’t personally tried it. This recipe looks so good I think I’m drooling! Any suggestions on how to make it gluten free but just as fudgy?? I don’t…maybe try GF flour that you normally use for baking and see how it goes. Thanks for trying the recipe and glad they worked out great using GF flour and XG! I followed the recipe exactly. The texture was nice, much like a dense and fudgy brownie, which I loved. The glaze was delicious! I’d totally use it for other baked goods. The flavor of the bars themselves was not great, however, in my opinion. They did have enough banana flavor but were definitely not sweet enough and tasted too floury. Kind of bland to me personally, although my son loved them. I think with some tweaks like some other added flavors- maybe adding a swirl of salted caramel topping in the batter, a dry banana or vanilla pudding mix, or cinnamon & other fall spices would make it a 5-star recipe for me. My bananas were pretty darn ripe but the bars could’ve used more sugar, I think. I would totally make it again with some added ingredients, I think it could definitely be amazing! Often people write saying there is too much sugar in recipes but rarely do I hear that you want more. I find the bars sweet enough as written, especially with the glaze, but everyone’s tastes are different. I definitely have a big sweet tooth! Haha. I’m excited to make these again with just a couple additions for myself. That nutty brown butter glaze is too irresistible! This recipe gets a perfect 10. I used soy milk instead of cream for the glaze and it came out great. Was plenty sweet for us. Delicious! I hope it tastes as good (better?) tomorrow as it did tonight. May have to freeze some since we are leaving for vacation soon. Thanks for the 5 star review and glad it gets a perfect 10! I am sure they will be just as good in the morning – banana desserts have a way of getting better the next day I find.